Added checks to make certain the Activation Menu only appear when the Player activates the bedrolls. Now, NPCs can activate/use the bedroll, without the player being interrupted by the menu (thanks miketheratguy for pointing this out). Complete retexturing of variants - less garrish 'dye in the wool' (geddit!) colors. Slight adjustment (slightly faster) to linear/angular Havok adjustment speeds on unpacked bedroll. 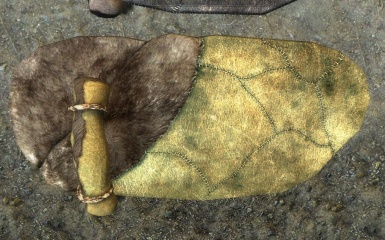 Created packed bedroll textures, matching unpacked bedrolls. Now included in 2 'Mods of the Week' videos! See the Videos section at the bottom of this readme. 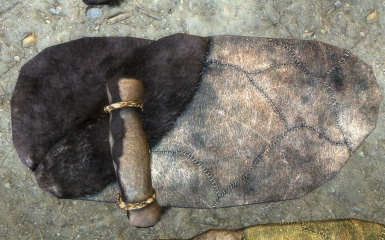 Allows crafting of bedrolls from (all) bear and Sabre Cat Snow pelts, with unique textures for each variant of pelt. 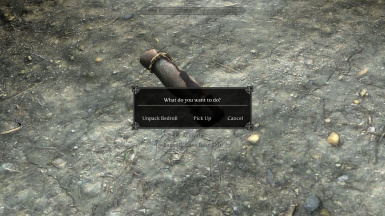 The inventory item (a rolled up bedroll) can be placed on the ground and activated, whereby it becomes a working bedroll. Activate this unpacked bedroll to use it (sleep) or repack and place in your inventory. The crafting recipes are for the Tanning Rack, and will only be visible if you have at least one of the appropriate type of pelt in inventory. 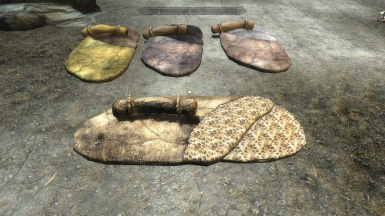 You can create as many bedrolls as you would like and the recipes require 1 bear pelt (or 1 Sabre Cat Snow Pelt), 2 pieces of leather and 3 leather strip. 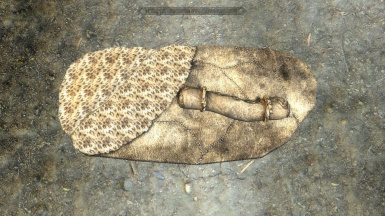 They weigh 2.5 stones and are valued at 50, 60, 70 and 90 Septims, depending on the pelt used. I'm a big fan of Frostfall, and the tents, but felt it was unrealistic to have to pitch a tent, just to use the bedroll. This makes sense when outdoors, but if I'm holed up in a cave (or other interior - like a fort) this seems strange. 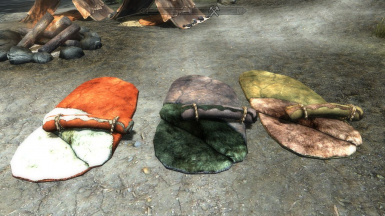 So I carry one of these bedrolls with me, and the Frostfall tents are kept in our horse(s). The bedrolls are Havok'd, so they will adjust to the contours of where they are placed, but the meshes have no bones, so the beds won't 'drape' like a fabric. The overall bedroll will tilt, angle, etc. to generally match the ground beneath. You can reposition (grab and hold, as you do any other item in the game) to fine tune the placement. Movement is *very slow* (that's by design) so it shouldn't be used for anything other than fine tuning. Unique meshes and textures were used, no vanilla assets were modified, and the mod was created according to recommended practices for Skyrim/Creation Kit/Papyrus (Reference Aliases, proper use of Disable/Delete, etc.) If you're aware of something that I did wrong (or could do better), let me know, but as it stands, everything in this mod should be 'safe'. NOTE: The original, more colorful textures are still available as an 'Optional' download. Just install the main files, then overwrite with the optional textures. Added checks to make certain the Activation Menu only appear when the Player activates the bedrolls. Now, NPCs can activate/use the bedroll, without the player being interrupted by the menu (thanks @miketheratguy for pointing this out). New collision mesh on unpacked bedroll (Replaced default bhkCompressedMeshShape collision box Created(which is still being reverse engineered by NifSkope team) with brand new bhkBoxShape collision mesh. This should result in better collision for the unpacked bedroll (still not perfect, due to game engine handling, but much better). 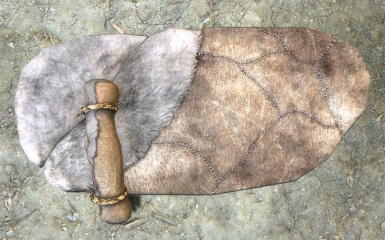 Added Sabre Cat Snow Bedroll variation, with unique texture. (No regular Sabre Cat --'Snow Cat' is, logically, suited for cold weather and it's fur suited for a bedroll lining). Understand logic could apply to Arctic Wolf, too. Still deciding on that one. Complete retexturing of variants - less saturated 'dye in the wool' (geddit!) colors. First public release version. Fingers crossed. 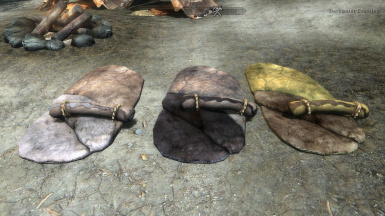 Occasionally, parts of the unpacked bedroll will start to disappear into the ground. This is an issue with the game engine and happens on very uneven ground. Just grab and hold the bedroll, and the Havok repositioning will start to pull it out of the ground. When its fully visible, step onto the bedroll and it will slowly drop back onto the ground and tilt/angle to matches the contours, while remaining completely visible. I continue to work on ways to avoid (or at least minimize) this, and have already spent several hours modifying the mesh's physics properties, but there's always room for improvement. Version 0.92 (and after) has a brand new packed bedroll mesh, with collission boxes on all sides, so you shouldn't see this issue with the this particular mesh. 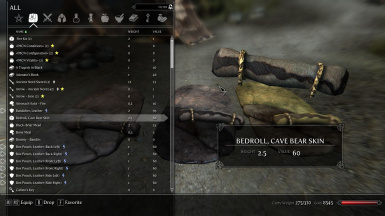 If you load a save, or enter a room with a placed/unpacked bedroll, the game engine may occasionally make the bedroll disappear into the ground. its not common, but again, it's an engine issue. If this happens, reload, or reenter the cell/room. It's probably something you've already seen in your game … so no surprises, really. Both of the above issues concern Havok and the game engine, when we add items to the game world. As stated, I continue to look for ways to minimize the chance of this occurring. If anyone has had success, please let me know. Haven't tested with Skyrim 1.6.x, but can't see why it wouldn't work (under the hood, it's pretty vanilla). Let me know. Ask. I'm pretty agreeable to just about anything, I'd just Like to know about it, first. If you install mods manually, you should already know what to do. Simple Structure. Packaged correctly. Again, if you have to ask, you' probably shouldn't be using WYRE BASH. I originally thought of creating varients for all/most hides/pelts, but in a world where every bar maiden has a choice of one (1!) outfit, and bandits all wear the same outfits (hey, I was going to wear that during the raid today! ), I think 3 (now 4, in version 0.93) variations is plenty. If you'd like, you can open the CK and change the constructible object recipe, miscellaneous object, activator and furniture objects to your heart's content. EVERTHING related to this mod begins with the prefix _NLQ_, so should be easy to find. Q: The bedrolls don't bend like real leather/fur. A: See above. I'm not a modeler, so can't create a mesh with bones/joints needed for that. If you can, and would like to, let me know. Or, if you know of some way to accomplish this with the existing mesh, let me know. Q: The Havok settings are too slow. A: Yes. I only wanted to provide a method to fine tune placement, for the occasion that you're camping on uneven ground and the game creates the bedroll partially in the ground. Creating a placeable bedroll that acts like other moveable objects looks weird with the rigid body (see above' re. mesh/bones) so I've settled on this. There are other mods with fully moveable bedrolls, so if this is your hang-up, try one of them. A: Originally, I was going to implement that. But, I decided that I really don't want to force the player to micro-manage a bedroll. Besides, there are no configuration settings in this mod, so I'd either have to introduce them (to allow the player to toggle this aspect on/off), or create 2 versions of the mod. Again, I'm going for simplicity here, but if you really bug me enough about this… maybe. Q: I installed this and now my [whatever] isn't working. A: I touched zero (0!) vanilla objects and the only thing that actually hooks into a vanilla asset is a properly created Reference Alias that only affects the crafted bedrolls in this mod. Are you sure your problems aren't due to another mod you installed (uninstalled, upgraded) around the same time as this one? However, there's always the chance … and if this mod is causing a problem, I want to fix it. Please provide as much detail as possible about the cause, what else you have installed that might be conflicting, explain if you can reproduce it, etc. If you just say, 'it's not working' (or something equally pathetic) you're probably not going to find much sympathy (or a solution). Seriously, if that's all the help you can provide, just uninstall this mod, and go play in traffic. The human gene pool could use the break. Not sure. I scaled back some initial ideas to keep this simple. As it stands, it does what it does and it's simple and works. I did put code in place to stop you from unpacking the bedroll, while outdoors, in the snow or rain. Seems like a neat little idea. I disabled this code, though, as there are places in the game where you're considered 'outdoors', even when there's a collision mesh to block rain and snow (The wreck of the Dainty Sload immediately comes to mind, as that's where my party is currently spending the night....) I could re-enable that code, and just pop up a quick message ("It's snowing! Seek shelter indoors"), but still allow the player to unpack the bedroll. Maybe even introduce the possibility of catching a cold if you sleep outdoors.... Any thoughts on this functionality are welcome. Frostfall. Cold weather/survival mod. 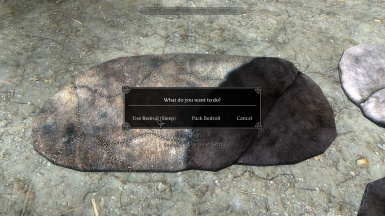 Skyrim 'feels' cold, after you install this. (The menu/activation systems of my mod are very similar(!!) to Frostfall's, so they'll seem a natural fit). Plus, I referenced Chesko's trig functions (GetOffset()), for object placement. Imps More Complex Needs (IMCN). Sleep, Thirst, Hunger Mod. There are others - I prefer this one. Sabre Gear Backpack. Helps with the 'visual' of carrying a bedroll.